A stunningly illustrated picture book biography about a Vermont farm boy named Wilson Bentley who loved snowflakes and spent hours taking thousands of photographs that reveal the beautiful structure of each tiny flake. Martin captures Bentley's passion and dedication in text that is infused with wonder, and the beautiful woodcut illustrations are a perfect complement to the story. This title is perfect for wintry days, especially given all the interesting facts about snowflakes that are sprinkled throughout, this increasing the educational value of this fine book and making it a perfect lead in to any snowflake craft activity. Here are a few sample pages from inside Snowflake Bentley. Mary Azarian's woodcuts are tinted with watercolors and charmingly evoke life in rural 19th century New England. They are also fittingly detailed for a book about a man who loved the intricate details he found in nature. This book is a great lead in to a lesson on winter weather and snowflakes. 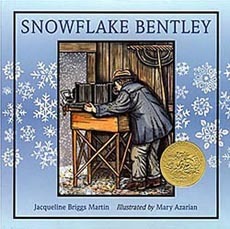 Read this book to you students, then extend the learning by slowly perusing and discussing the photographs in one of the following books of Bentley's actual snowflake photographs. You can finish up the lesson by having the students make their own paper snowflakes, putting them up on the board, and then discussing how, just like actual snowflakes, no two paper snowflakes are exactly alike. Draw attention to how much diversity there is in just those paper snowflakes made by your class and how that diversity in snowflakes is found in nature as well. A collection of 2,000 micro-photographs of snowflakes, plus some images of frost, dew, and hail. For more on this book, click here. Also check out the following web pages for more ideas.